The support must be offered via Tomahawk's InputManager. I need to create and mantain the vibration effects as separated "assets". The vibration itselft must be defined using two curves, one for each motors in the gamepad. 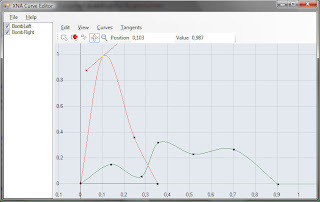 Note: For curves, I used the XNA Curves, to be able to use the Curve Editor that's available in the Creators website. We already used these curves in the engine for other subsystems, and this tools itself is included in the Tools folder of the Tomahawk engine. Then I added a VibrationManager to the game, in which I defined the VibrationPackage concept. It's nothing more that a collection of RumbleEffects, to be able to define several effects in a single XML file (inlining arquetypes it's supported by Tomahawk). Also put a public method to invoke a concrete effect, on a concrete gamepad, and voilá... vibration support done! Publicado por nolver en 11:16 a. m.